Model:TPC950101 AJAX BALL PEN Description: Ultra-modern design - this futuristic design balances quality and design to produce a 21st century pen. The slate colour option exudes style! Engraves well at an additional cost. Black Ink. Colour Options: Black,Slate,Silver Product Data Specification Product Size 145 x 12mm dia. Product Weight Ink Colours If Applicable Black Additional Information Price includes 1 colour print to 1 position only. Set up and carriage are additional. Lead Times 7 working days from artwork approval. Personalisation Data Max Personalisation Pad/Screen Print Area 30 x 20 mm Engraving Area 30 x 7 mm Full Colour Area N/A Embroided Area N/A Max Spot Colours N/A Foil Block Embossing N/A Notes Price includes 1 colour print to 1 position only. Set up and carriage are additional. 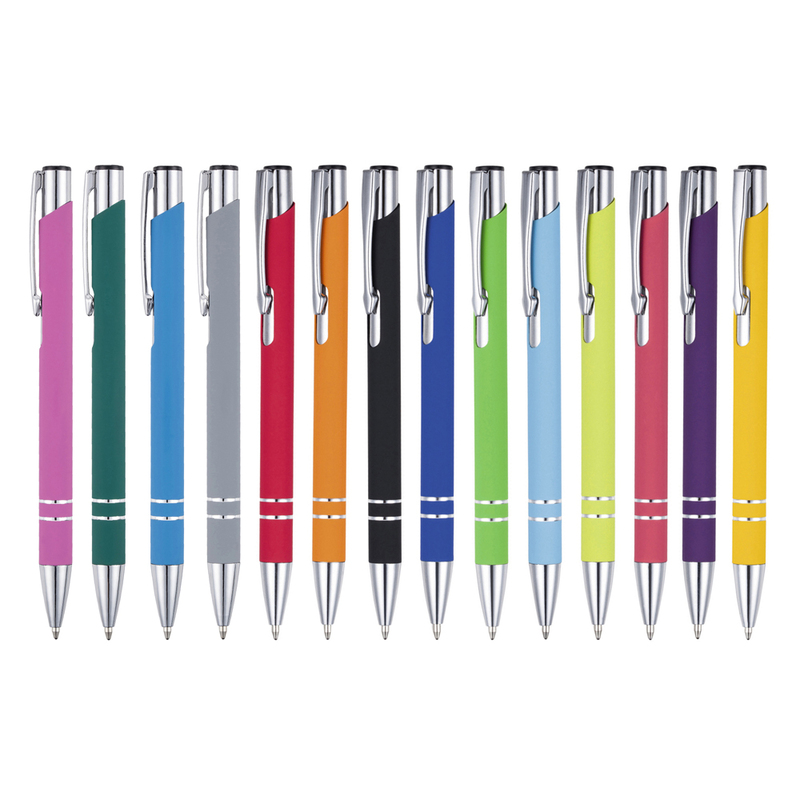 Model:TPC731501 ALADDIN BALL PEN Description: Classic style soft feel ball pen in a choice of vibrant colours. 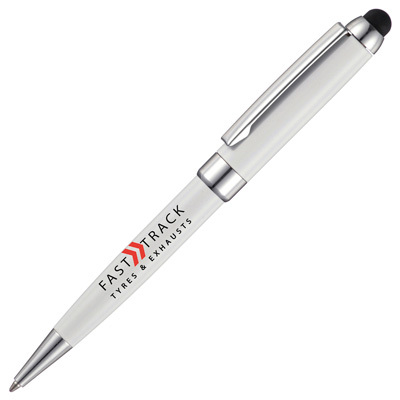 The pen can be engraved or digitally printed to 1 position. Black ink. Colour Options: Amber,Black,Blue,Green,Light Green,Lilac,Pink,Red,Teal,Yellow Product Data Specification Product Size 137 x 10mm dia. Product Weight Ink Colours If Applicable Black Additional Information Price includes engraving to 1 position only. Set ups and carriage are additional. Lead Times 5 working days from artwork approval. Personalisation Data Max Personalisation Pad/Screen Print Area 40 x 10 mm Engraving Area 40 x 10 mm (side of barrel), 26 x 10 mm (in line with clip) Full Colour Area 40 x 7 mm Embroided Area N/A Max Spot Colours N/A Foil Block Embossing N/A Notes Price includes engraving to 1 position only. Set ups and carriage are additional. Model:TPC620201 ASTON STYLUS BALL PEN Description: A heavy twist action stylus pen that exudes quality with a stylus end for your touch screen devices. Colour Options: Black,White,Silver Product Data Specification Product Size 139 x 11 mm dia. Product Weight Ink Colours If Applicable Black Additional Information Price includes 1 colour print to 1 position only. Set up and carriage are additional. Lead Times 7 working days from artwork approval. Personalisation Data Max Personalisation Pad/Screen Print Area 30 x 20 mm Engraving Area 30 x 7 mm Full Colour Area 30 x 7 mm Embroided Area N/A Max Spot Colours N/A Foil Block Embossing N/A Notes Price includes 1 colour print to 1 position only. Set up and carriage are additional. 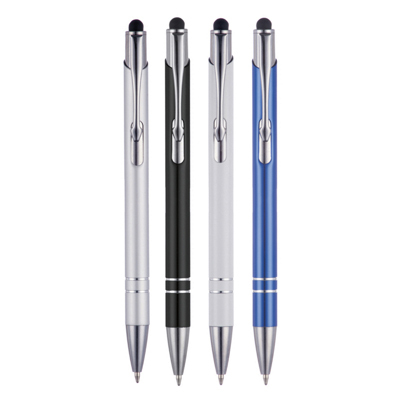 Model:TPC730901 BECK BALL PEN Description: Incredible value in this metal pen that can be printed or engraved at the same price!. There is a great marking area on the barrel. Great range of colours. Colour Options: Amber,Black,Blue,Burgundy,Gun Metal,Green,Grey,Pink,Purple,Red,Silver,White,Yellow,Light Blue Product Data Specification Product Size 137 x 10 mm dia. Product Weight Ink Colours If Applicable Black Additional Information Price includes 1 colour print to 1 position only. Set up and carriage are additional. Lead Times 7 working days from artwork approval. For Priority Service Lead times and pricing info please visit Priority-Service for more information. Personalisation Data Max Personalisation Pad/Screen Print Area 40 x 20 mm Engraving Area 60 x 7 mm (side of barrel), 40 x 10 mm (in line with clip) Full Colour Area 60 x 7 mm Embroided Area N/A Max Spot Colours N/A Foil Block Embossing N/A Notes Price includes 1 colour print to 1 position only. Set up and carriage are additional. Model:TPC730903 BECK GOLD Description: A gold trim version of our best selling metal ball pen. Incredible value! Colour Options: Black Product Data Specification Product Size 138 x10 mm dia Product Weight0.017 Ink Colours If Applicable black Additional Information Price includes 1 colour print to 1 position only. Set up and carriage are additional. Lead Times 7 working days from approval of artwork Personalisation Data Max Personalisation Pad/Screen Print Area 50 x 20 mm Engraving Area 50 x 10 mm Full Colour Area N/A Embroided Area N/A Max Spot Colours N/A Foil Block Embossing N/A Notes Price includes a 1 colour print to 1 position. Set up and carriage are additional. Model:TPC730902 BECK LUX ENGRAVED Description: A luxe version of our best selling metal pen. 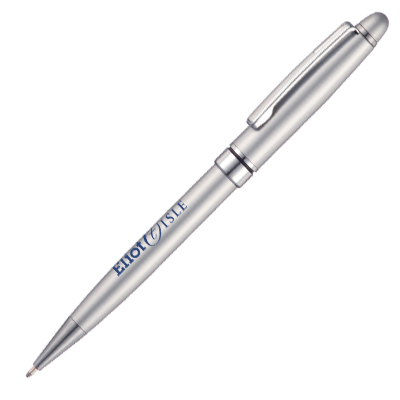 The pen engraves chrome for an elegant, stand out finish. Colour Options: Black,Blue Product Data Specification Product Size 138 x 10 mm dia Product Weight0.015 Ink Colours If Applicable black Additional Information Price includes engraving to 1 position. Set up and carriage are additional. Lead Times 5 working days from approval of artwork Personalisation Data Max Personalisation Pad/Screen Print Area N/A Engraving Area 50 x 10 mm Full Colour Area N/A Embroided Area N/A Max Spot Colours N/A Foil Block Embossing N/A Notes Price includes a 1 colour print to 1 position. Set up and carriage are additional. 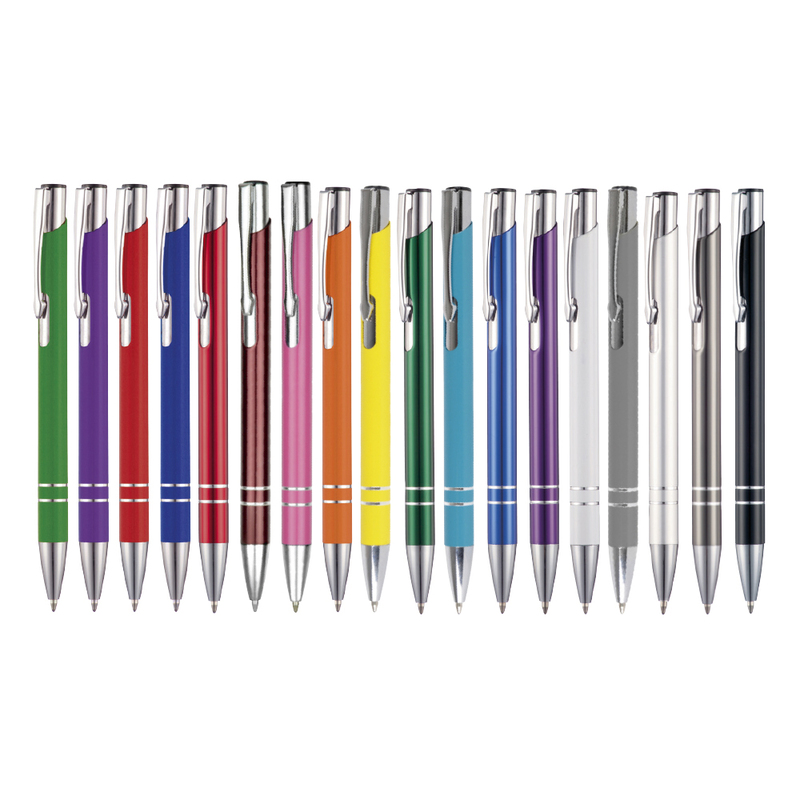 Model:TPC731701 BECK SOFTFEEL Description: An aluminium pen with a 'soft-feel' finish for a tactile experience when using this pen. Given the finish of this model, marking is by engrave or digital print only. Colour Options: Amber,Black,Blue,Green,Light Blue,Light Green,Pink,Purple,Red,Yellow 0.017 Product Data Specification Product Size 136 x 10 mm dia Product Weight Ink Colours If Applicable black Additional Information Price includes engraving to 1 position. Set up and carriage are additional. Lead Times 5 working days from approval of artwork Personalisation Data Max Personalisation Pad/Screen Print Area N/A Engraving Area 40 x 10 mm Full Colour Area 50 x 7 mm Embroided Area N/A Max Spot Colours N/A Foil Block Embossing N/A Notes Price includes a 1 colour print to 1 position. Set up and carriage are additional. 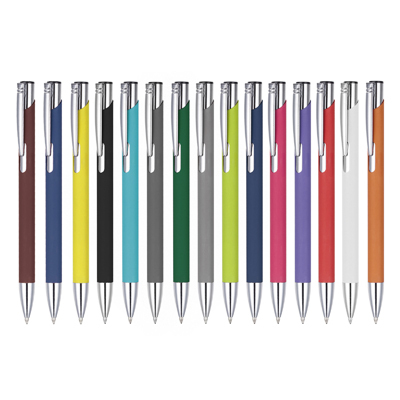 Model:TPC731001 BECK STYLUS BALL PEN Description: A 'tech' version of the great value Beck pen that includes a stylus end piece at the nose cone end. Available in the Beck's most popular colours Colour Options: Black,Blue,Silver,White Product Data Specification Product Size 139 x 10 mm dia. Product Weight Ink Colours If Applicable Black Additional Information Price includes 1 colour print to 1 position only. Set up and carriage are additional. Lead Times 7 working days from artwork approval. For Priority Service Lead times and pricing info please visit Priority-Service for more information. Personalisation Data Max Personalisation Pad/Screen Print Area 40 x 20 mm Engraving Area 60 x 7 mm (side of barrel), 40 x 10 mm (in line with clip) Full Colour Area 60 x 7 mm Embroided Area N/A Max Spot Colours N/A Foil Block Embossing N/A Notes Price includes 1 colour print to 1 position only. Set up and carriage are additional. Model:TPC731301 BECK STYLUS PLUS Description: A 'tech' version of the great value Beck pen that includes a stylus end piece at the nose cone end. Available in the Beck's most popular colours Colour Options: Black,Blue,Silver,White Product Data Specification Product Size 139 x 10mm Product Weight Ink Colours If Applicable Black Additional Information Price includes 1 colour print to 1 position only. Set up and carriage are additional. Lead Times 7 working days from artwork approval. For Priority Service Lead times and pricing info please visit Priority-Service for more information. Personalisation Data Max Personalisation Pad/Screen Print Area 40 x 20 mm Engraving Area 60 x 7 mm (side of barrel), 40 x 10 mm (in line with clip) Full Colour Area 60 x 7 mm Embroided Area N/A Max Spot Colours N/A Foil Block Embossing N/A Notes Price includes 1 colour print to 1 position only. Set up and carriage are additional. Model:TPC982001 BHQ MOLE-MATE SATIN NO RINGS Description: The perfect partner for an A5 mole pad! The tactile satin-matt finish complements the notebook beautifully, with a range of colours to match. Colour Options: Amber,Black,Blue,Burgundy,Cyan,Dark Blue,Dark Grey,Green,Light Green,Pink,Purple,Red,White,Yellow Product Data Specification Product Size 139 x 10 mm dia Product Weight0.016 Ink Colours If Applicable black Additional Information Price includes 1 colour print to 1 position only. Set up and carriage are additional. Lead Times 7 working days from approval of artwork Personalisation Data Max Personalisation Pad/Screen Print Area 50 x 20 mm Engraving Area 50 x 10 mm Full Colour Area N/A Embroided Area N/A Max Spot Colours N/A Foil Block Embossing N/A Notes Price includes a 1 colour print to 1 position. Set up and carriage are additional.